Among other things, the chipmaker's CEO shared details about AMD's efforts to cater to cloud giants, and was optimistic about the long-term growth outlook for its console processor business. AMD (AMD - Get Report) is doing a lot of work behind the scenes to address customer needs and concerns as it tries to grow its data center footprint. That was one of the key takeaways from a one-on-one interview TheStreet did with CEO Lisa Su at AMD's Next Horizon event in San Francisco on Tuesday. The discussion took place shortly after AMD unveiled the Radeon Instinct MI60 and MI50 server GPUs that rely on Taiwan Semiconductor's (TSM - Get Report) advanced 7-nanometer (7nm) manufacturing process, and also previewed the company's first 7nm Epyc server CPUs. AMD has set a goal of achieving a mid-single digit server CPU share by the end of 2018, and of eventually having a double-digit share. When I asked about AMD's time frame for achieving the latter milestone, Su said the exact date will depend on the adoption rate for Rome, which AMD is currently sampling to select clients. However, she also mentioned that AMD considers "somewhere in the next four-to-six quarters" to be a "reasonable expectation" for the company. 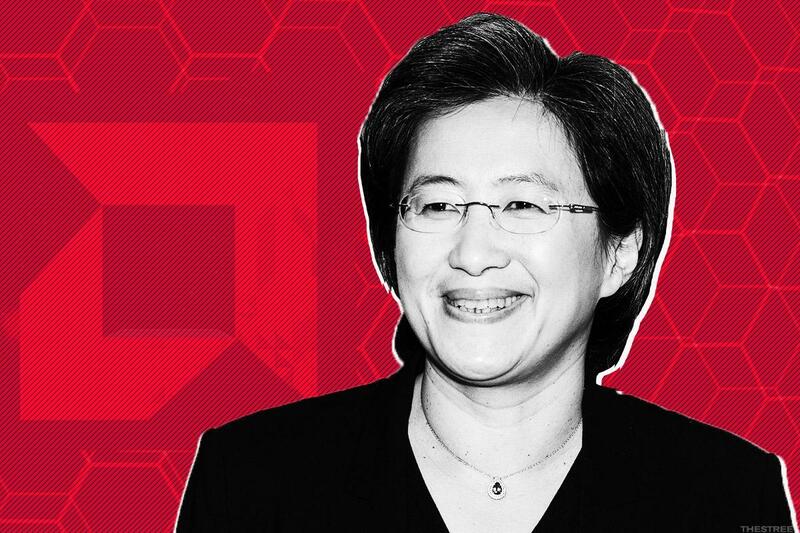 Su has been at the helm of AMD since 2014. During its event, AMD only said that its Rome server CPUs, which are promised to feature up to 64 cores and deliver twice the performance per CPU socket as AMD's first-gen "Naples" Epyc CPUs, would arrive in 2019. When I asked if she could share any details on Rome's 2019 rollout, Su didn't respond with an expected launch date, but did say that AMD expects Rome to "be a meaningful percentage of our revenue next year." "It is a data center CPU, so it takes some time," Su said. "We expect to be in high-volume production in 2019...And as we get closer to production, we'll talk about exact dates." AMD hasn't yet shared details about its planned 7nm Ryzen PC CPUs, which -- like Rome -- will rely on the company's next-gen Zen 2 CPU core architecture. Many think an announcement will arrive at January's CES trade show, where Su is giving a keynote. When asked about how AMD could leverage 7nm and Zen 2 in the PC CPU market, Su indicated that the use of 7nm will "bring out new products on top of everything we've done with Ryzen 1st-generation, Ryzen 2nd-generation." Using 7nm delivers major improvements in CPU core density and (relative to performance) power consumption compared with the 14nm and 12nm processes that are used, respectively, by AMD's first-gen and second-gen Ryzen products. The notebook CPU market is arguably a logical place for such product line expansion, particularly given 7nm's power consumption benefits. While AMD has created an expansive desktop and workstation processor lineup via its Ryzen and Ryzen Threadripper platforms, its Ryzen Mobile notebook platform for now consists of just four integrated CPUs/GPUs that launched in late 2017. One interesting stat shared by AMD at its event: Whereas the world's 10 biggest server customers accounted for less than 10% of the market's CPU purchases a decade ago, the world's seven biggest customers today-- it's safe to assume the list includes names such as Amazon.com (AMZN - Get Report) , Alphabet (GOOGL - Get Report) and Facebook (FB - Get Report) -- now account for about 40% of purchases. Intel, which accounts for the lion's share of server CPU sales to these buyers, has put a lot of work into creating custom Xeon server CPUs for these firms. The company has also signaled it will step up the amount of custom work it does as its just-unveiled Cascade Lake platform begins shipping in the first half of 2019. For her part, Su indicated that AMD is doing similar work for its big cloud clients, noting that different buyers have different priorities in areas such as performance and power consumption. "I think it's part of doing business in the cloud...optimizing for these key applications," she said. "And that's something that we're doing today, and that we'll do more of going forward." A lot of attention has been given to the launch of cloud computing service instances for businesses that rely on Epyc CPUs, with Microsoft (MSFT - Get Report) , Baidu (BIDU - Get Report) and Tencent all having launched them since Epyc's debut in the summer of 2017. Amazon's name was added to the list on Tuesday. But there hasn't been as much attention given to AMD's efforts to sell CPUs that power the offerings that cloud service providers deliver directly to consumers, such as search results, streaming content, news feeds, voice assistant services, etc.). Tencent (TCEHY and Dropbox (DBX are among the companies known to be using Epyc for such work, but some major engagements might be unknown, since cloud giants often prefer to stay tight-lipped about the hardware and silicon that they're using internally. Without naming particular clients, Su suggested the use of Epyc CPUs by cloud providers for their internal workloads will grow as more of their software is optimized for Epyc, instead of being solely optimized for Intel CPUs. "There are differences between our architecture and the competition's architecture, and so there is some software optimization that needs to be done, some of the schedulers and the tools, and those are the types of the things that we're doing with our customers" Su said. She also argued that the high core counts of Epyc CPUs are a selling point with cloud buyers. Amazon.com, Alphabet, Facebook and Microsoft are holdings in Jim Cramer's Action Alerts PLUS member club. Want to be alerted before Jim Cramer buys or sells AMZN, GOOGL, FB or MSFT? Learn more now. 6. AMD Wants to Keep Cutting-Edge Technology "Close to the Chest"
Back in 2016, AMD launched a JV that (with the help of x86 CPU IP licensed by AMD) aims to develop processors for the Chinese server market. The company owns a majority stake in one part of the JV, known as THATIC, and a minority stake in the other. It's also entitled to royalty payments on THATIC's product sales. Su says AMD is pleased with how THATIC, which has led to the creation of a CPU line (called Dhyana) that relies on AMD's Zen CPU core architecture, has progressed to date. Nonetheless, at a time when the U.S. government is increasing its scrutiny of technology transfers to Chinese companies, Su insists AMD will continue safeguarding its most advanced IP. "[W]e're very focused on ensuring that the leading-edge technology continues to be our trade secret, something that we keep very close to the chest," she said. "And we'll continue to do that." On its Q3 earnings call, Su forecast that AMD's semi-custom chip business, which supplies integrated CPUs/GPUs for the Xbox One and PlayStation 4, will decline in 2019. That wasn't too surprising, since Xbox One and PS4 both originally launched in 2013 and (the launch of 4K-capable models notwithstanding) are starting to show their age. But will the semi-custom business grow in future years, as new consoles are launched? Su struck an upbeat tone on the subject. "Without saying anything about any of our customers' roadmaps...consoles will continue to be important in the [gaming] industry," she said. "When I look at AMD's position in the console market, I feel good about our position. And I feel good about...our custom business continuing to be a growth driver for us post-2019." Microsoft news site Thurrott reported in June that a "family" of next-gen Xboxes is planned for 2020. Comments made earlier this year by a Sony exec have been taken by some to indicate a next-gen PlayStation won't launch before 2021, but there's been some debate about that interpretation. One June report claimed the PS5 is expected around 2020.